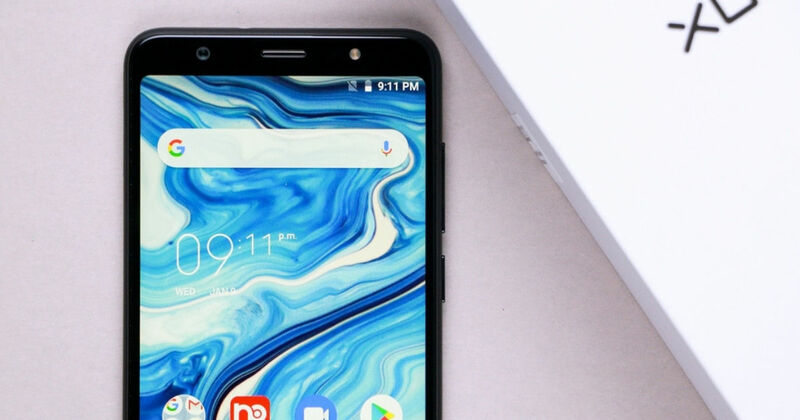 After taking a hiatus of almost a year, the home-bred phonemaker XOLO returned to the turf earlier this year with the launch of Era 4X (first impressions) and Era 5X. The former was already launched back in January, whereas the Era 5X has been launched by the company recently. The newest handset has been launched in the sub-Rs 8,000 segment in the country and lands smack dab in the middle of heavyweights from the likes of Xiaomi, Realme, Honor and ASUS. The company sent over a retail unit over to our office and here’s what I think of the phone after spending a short stint with it. The XOLO Era 5X comes in a white box with minimal branding all around and the phone’s graphics with core specs listed on the bottom. As soon as you lift the lid of the box, you will find the Era 5X wrapped in plastic lying atop a cardboard tray. Below the tray, you’ll see the transparent protective case with screen protector. At the very last, there’s the wall charger, micro-USB cable and the SIM-ejector tool. As is customary with budget smartphones, the brand has not provided earphones with the Era 5X. As for the Era 5X, the smartphone has been crafted out of polycarbonate with a matte finish, which fooled me into thinking that it’s made of metal. What gives it away is the glossy plastic antenna lines running along the top and bottom edges on the rear panel. Speaking of the rear cover, there’s a single cameras module with LED flash in top left corner, squircle fingerprint scanner towards the centre, XOLO branding in the centre and loudspeaker grille towards the bottom. Coming to the sides, there’s a dual-SIM slot with dedicated microSD card slot on left, physical buttons on right, 3.5mm audio socket on the top and a micro-USB cable at the bottom. Moving to the front of the XOLO Era 5X, the phone has been equipped with a 5.7-inch HD+ IPS In-Cell display. The panel is pretty decent and offers good viewing angles and sunlight legibility. As for the features, the company has included the auto-brightness and night light to avoid eye fatigue during prolonged smartphone usage. However, apart from these, there is nothing to write home about when it comes to Era 5X’ display. In the performance department, the XOLO Era 5X comes equipped with MediaTek’s Helio A22 SoC clocked at 2.0GHz quad-core processor and IMG PowerVR GE GPU. The processor is further accompanied by 3GB of RAM and 32GB storage, which can be further expanded up to 128GB through a microSD card. After account for OS and systerm resources, the smartphone offers around 22.5GB to the end user. In the short time that I spent with the handset, it handled regular tasks with ease but did struggle a bit with more than five apps open and switching between them. For software, the XOLO Era 5X boots the dated Android 8.1 Oreo out of the box with a custom interface on top. The drawerless interface has all the icons laid neatly on the homescreen. And even though the software does come with its fair share of bloatware, most of them are third-party apps and can be uninstalled. Lastly, the phone is powered by a 3,000mAh battery and comes with 7.5W fast-charging support. The XOLO Era 5X sports a 13MP primary camera with LED flash and 5P Largan lens on the rear panel. The smartphone offers the same sensor on the front as well for selfies and video calling. The camera app has been equipped with features like portrait lighting, real-time bokeh, face beauty, HDR, panorama, AR stickers, Super Night mode, and intelligent selfie. The initial shots taken from the smartphone in normal mode are pleasant, however, in portrait mode, the phone misses the mark when it comes to detecting the edges. However, flip over to the front camera and results are surprisingly pleasant with the studio mode being quite impressive. For the uninitiated, the studio mode is inspired by Apple’s Portrait Lighting mode for selfies. As I mentioned in the beginning, with a price tag of Rs 7,499, the XOLO Era 5X lands among some serious contenders like the Samsung Galaxy M10 (review), and Xiaomi Redmi 6 (review). If you increase your budget slightly, you have even better options such as the Realme 3 (review) and ASUS ZenFone Max Pro M1 (review). And therein lies the problem for the Era 5X, it’s not a bad option as such, but the competition is just better.